Our Debating Chamber series of papers focus on key investment issues of interest for wealth managers, professional advisers and investors, with the aim of stimulating and supporting objective and informed debate and careful consideration of the issues. Drawing on the input of external consultants and industry experts, each paper identifies and dissects relevant data to get to the pertinent facts, aiming to prove or disprove specific hypotheses. You can see ‘teaser pieces’ for issues that we intend to cover in future Debating Chamber papers in the ‘Thinking Investments’ area of our website. If you have suggestions for topics that you think we could cover, do please contact us to let us know. 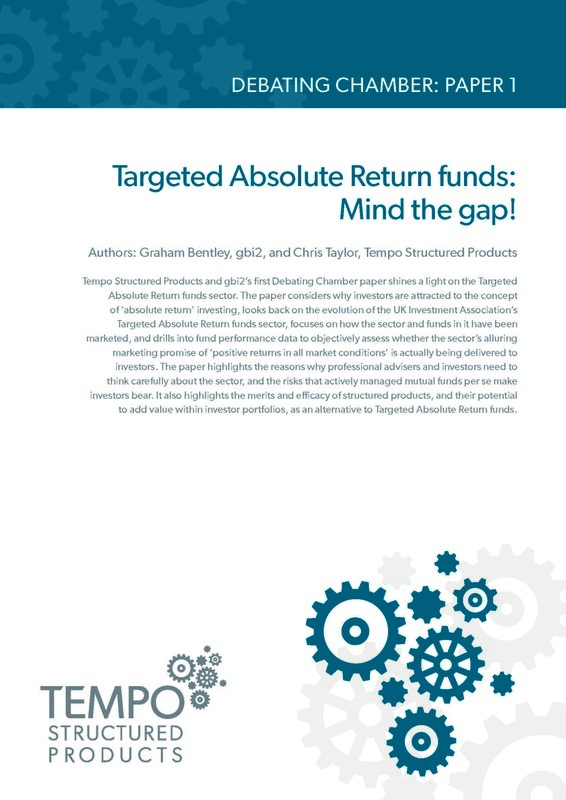 Targeted Absolute Return funds: Mind the gap! Our first Debating Chamber, written in conjunction with gbi2, shines a light on the Targeted Absolute Return funds sector. The paper considers why investors are attracted to the concept of ‘absolute return’ investing, looks back on the evolution of the UK Investment Association’s Targeted Absolute Return funds sector, focuses on how the sector and funds in it have been marketed, and drills into fund performance data to objectively assess whether the sector’s alluring marketing promise of ‘positive returns in all market conditions’ is actually being delivered to investors. It highlights the reasons why professional advisers and investors need to think carefully about the Targeted Absolute Return funds sector … and the risks that actively managed mutual funds per se make investors bear. The fact is that the risks of active fund management, including complex fund strategies such as Targeted Absolute Return funds, are not borne by fund managers, they are worn by investors… and this contrasts with structured products. Structured products allow investors to abdicate from various risks, including market risk and fund management risk, delegating these risks to investment banks / counterparties, who must deliver what they promise, in the terms of the bonds that they issue, with no wriggle room, no explanations, and no apologies, unless they are bust. This is a significant USP benefit of structured products, that can serve investors well, in diversified and balanced portfolios. The paper prompts professional advisers and investors to think objectively about the merits and efficacy of structured products, and their potential to add value within investor portfolios.